Picture yourself enjoying theperfect balance of city and suburban life in our Timberland townhomes for rentin Ottawa. Situated in an elegant rental enclave among a quiet, peacefulneighbourhood, you'll live in close proximity to all the amenities you'll needwhile living in these private townhomes. Nearby access to highways and localshops make life at Timberline Townhomes convenient and easy. 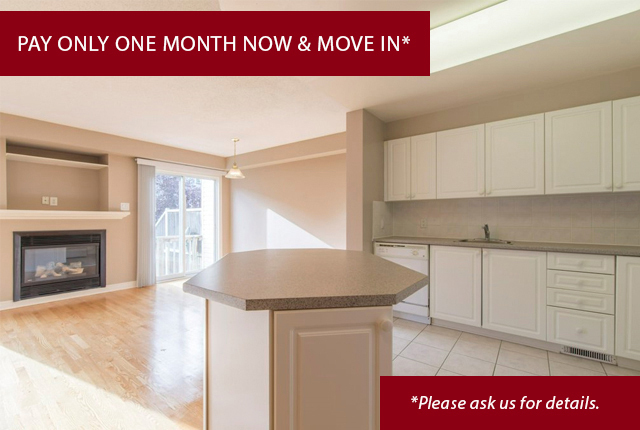 These Ottawa townhomes for rentfeature nine foot ceilings, dishwashers and in-suite laundry, plus your ownprivate driveway and garage. Get everything you need withina short distance from home with restaurants, shops and schools situated nearby. Navigate your commute easilywith close proximity to Highways 416 and 417, plus convenient access to OCTranspo, Strandherd Park and Ride and Via Rail. Close by secondary schools andhospitals make Timberline Townhomes the perfect place for families to rent. Take advantage of our capitalcity's cultural offerings all year long, such as summertime festivals,Winterlude and ice skating along the Rideau Canal.